Biomagnification is the process in which toxins are concentrated in an organism as larger animals continue to eat smaller animals. This process moves toxins up the food chain to larger organisms and is of particular concern with regards to concentrating dangerous toxins in larger species. There are many biological processes in the world and many of these intersect with human activities along with their normal interactions. For instance, many migratory patterns of animals can change or become disrupted because of human activities of natural changes in the environment. With an increase in urbanization, there are so many new structures in place of natural ones and animals that once used those spaces have become displaced. Natural disasters like forest fires can also alter the environment that is used by animals for migration, mating, living, and even hunting. Among the different kinds of biological processes is biomagnification. Biomagnification is essentially the accumulation of a certain substance, like a toxic chemical, in the tissues of an organism as we move up the food chain. As we are moving up the food chain, these substances become more concentrated in the higher levels. The opposite of biomagnification is biodilution, which results in dilution of substances as we move up the food chain. In general, the use of biomagnification is associated with dangerous toxins and chemicals that are released because of human actions. Understanding biomagnification allows us to gain an insight into how our actions affect the world we live in as well as the food we might consume as the process comes full circle. Substances involved in biomagnification can be broken into two main categories: persistent organic pollutants and metals. Both of these groups are not easily degraded by organisms and are lipophilic. Persistent organic pollutants are novel organic substances made by humans. They are relatively new substances and organisms have not developed ways to adequately degrade them, which contributes to their accumulation. Metals cannot be degraded because they are elements. However, organisms do have mechanisms to get rid of them as they occur naturally. They become a problem when additional metals are introduced into the environment, adding to the natural level. This raises the amounts far higher than what the organisms can remove, which results in their accumulation. Understanding the substances is important, but knowing where they come from is also important and a crucial point where we can intervene to make changes. Toxic chemicals and heavy metals run into the ocean because of industrial, agricultural, and human waste. These waste products are dumped into the sea from runoffs or deliberate actions. 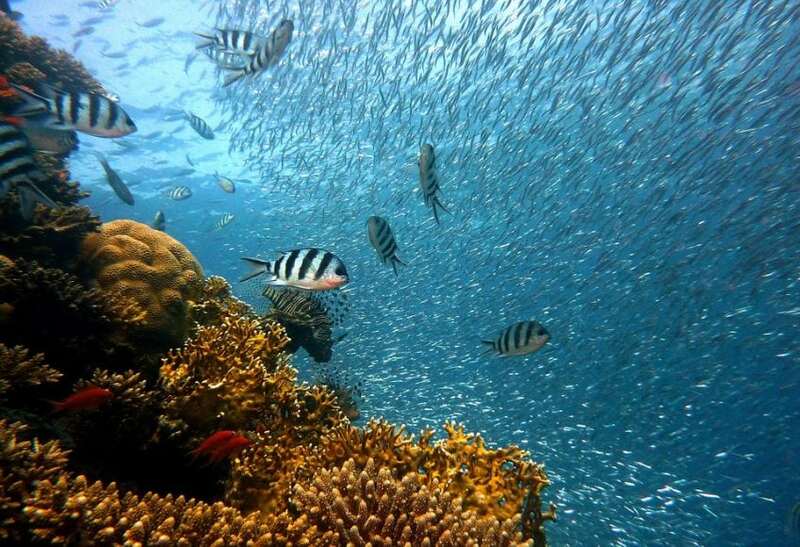 These chemicals and metals have been linked to many problems including disease, birth defects, behavioral changes, reproductive problems, and genetic mutations within marine organisms. They also contribute to their deaths. Agricultural products like pesticides, fungicides, herbicides, and chemical fertilizers seep into the soil as they are released in farms and other agricultural areas. They eventually make their way towards the sea. Many of these products have heavy metals in them, like mercury, cadmium, or arsenic. Pollution from factories, mining, and other industrial processes are widely known and many of those pollutants are toxic chemicals as well as metals that eventually accumulates in the food chain. Besides contaminating water supplies, they also contaminate the soil and rivers. There is also ocean mining, which tries to extract important metals for human use because we are depleting the mines we have on the surface. Rahul Sharma, from the CSIR-National Institute of Oceanography in India, examined the environmental impact of deep-sea mining and found that mining process also disrupted the surrounding environment. It disrupted the local fauna and much marine life. It also released small amounts of the metals that it was mining into the surrounding water. He anticipated that these metals would result in altered behavior as well as the death of surrounding marine life. As the substances of biomagnification leech into the environment and are absorbed, we begin to see their effects. Generally, the organisms at the bottom of the food chain are not entirely affected by biomagnification because the concentration of substances is relatively low. As it increases in the higher levels, we begin to see the problems. One of the most infamous persistent organic pollutants is DDT, an organic compound used as an insecticide. Discovered as an insecticide by Swiss chemist Paul Hermann Müller in 1939, DDT was used in troves to prevent malaria and typhus. Müller was even awarded a noble prize for finding the insecticide trait of DDT. Despite its effectiveness, DDT was eventually banned in the United States and across the world because it posed a great risk to the world. It accumulated in large quantities in the soil and bodies of water and was directly contributed to the downfall of many creatures, like birds. It also has been found to have carcinogenic properties in humans. DDT is slowly accumulated in plankton, which was eaten by fish. These fish, which now accumulated more DDT, were then eaten by bigger fish until they were eventually eaten by birds. These birds had relatively large amounts of DDT in their system. The 1972 ban is greatly contributed to their survival and population growth since DDT was no longer accumulating in such large quantities as it was before. With climate change greatly affecting the wellbeing of coral reefs around the world, the coral reefs also have another problem: cyanide. Despite being illegal, cyanide fishing is widely used in Southeast Asia by fishers because it is an effective way of catching fish. The cyanide is introduced as crushed tablets placed in squirt bottles. These are then sprayed across the water and reef fishes are stunned by the cyanide. This is great for the fishers because it is a $200 million industry, but the fishes and the coral reef pay the price. There is much anecdotal evidence that links the cyanide to cancer and a lowered lifespan in fish caught this way. There is also ample evidence and research that shows that the cyanide accumulates in the corals of these reefs and kills them. As the coral reefs die, the organisms that depend on them also die. As we understand more of biomagnification and the many factors that play into the process, we can better act to prevent destruction such as this. Previous Post« Previous What Is Agar?